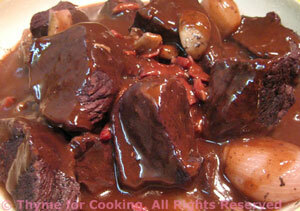 Boeuf Bourguignon, Thyme for Cooking easy gourmet dinners. 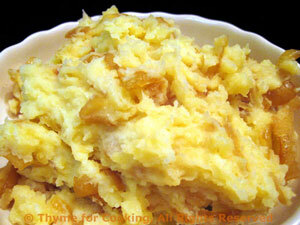 This is classic French Bistro fare and one of those long-cooking dishes that I love doing during the winter. It simmers while you get on with your life, You could actually let it cook for 4 - 5 hours and it would be fine - maybe even better.... And, it's enough for two meals. As we have lentils to start, shallots with the beef and onions with the potatoes.... No additional vegetable with this meal. We sautéed the walnuts and half of the ham in butter to enhance the flavor and add crunch to the salad. I use the tiny green French lentils - du Puy. You could use larger brown lentils but not the red ones, they get too mushy. Put in a small sauce pan along with stock and water and bring to a boil. Reduce heat, cover and cook until done - about 20 minutes. Taste to determine when done properly. Drain any excess cooking liquid and set aside. Heat butter in a medium nonstick skillet over medium-high heat. Add walnuts and sauté about 5 minutes, stirring frequently. Roughly chop 2 slices of Prosciutto and add to walnuts. Sauté until Prosciutto is crisp, another 4 - 5 minutes. Remove and break walnut halves in half. Just before serving mix oils, soy sauce, mustard and vinegar in bowl large enough to hold lentils. 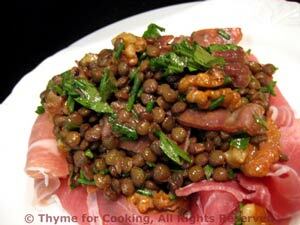 Add lentils, chopped ham, walnuts and herbs and mix well. Cut remaining 2 slices of Prosciutto in half the long way. Arrange in a circle on 2 plates. Spoon lentil salad in the center and serve. 2 medium skillets (1 used 2X), small saucepan.